Vern Burkhardt (VB): In Navigating From The Future you talk about "sustainable transformation." Is this the essence of creativity and innovation? Charles Smith:	Creativity calls for returning to a zero point; returning to a possibility. It's pure invention. Sustainable Transformation is a misnomer as it's generally used. You're not really sustaining something. In order for transformation to happen, you have to become present or "real," in the strongest possible sense, to what is going on now and to the inhibiting influences of the past. The past stops us from thinking about what's new or could be new. Sustainable Transformation means looking at things as they truly are right now, as we truly are now, with a clear mind. And then we can invent what we want. This may include re-inventing some aspect of what already exists, something else. So yes, sustainable transformation is the essence of creativity. It's the essence of sprouting something that isn't already in existence. My view of creativity in its pure sense isn't simply improving something. This is our approach to creativity when we are working with people in companies. I had an interesting conversation with a woman from a food company in China which is working hard to improve a cookie. They're having a difficult time because they can't start from a zero point. The improved cookie has to look and taste similar to the old cookie, but somehow it has to be new and have greater appeal to more people. In such as case the effort at creativity goes largely towards messaging about how to present the cookie. They won't be able to invent anything new because they're stuck with what they already have. In a similar vein, an awful lot of what's going on in the world in the name of creativity and innovation cannot produce what companies are after or what their customers want. They're stuck with their past. VB: In order to have the type of creativity you're talking about, you have to train yourself to not think about your past experiences? Charles Smith: It's the notion of "beginner's mind" starting with a blank slate. A Quantum Physics view indicates that the world consists of an infinite number of possibilities that don't come into existence until you ask a question. The real creativity involves coming up with questions for which the answers will generate something that's new. A lot of it has to do with your worldview in the first place. I've recently become interested in traditional Micronesian navigation. Micronesians sailed from island to island without navigation instruments. Their navigation was a discipline, but it was very intuitive. Our view is that you move from here into the future, such as you and I are moving into the future right now. Micronesians believe that you're standing still, and the future is coming to you. If you can put this into your mind, you'll start to experience things differently. You'll start to see which aspects of what's coming to you are attractive, and which aspects are subtle. You'll start measuring different things. In one sense a lot of what I'm talking about is what Eckhart Tolle talks about, or pure Buddhism. It's "beginner's mind." It's "being present." You can make a strong case that transformation, an altered state or a new possibility, comes from "being present." We can "become present" with one another and in time something new will happen. If we don't "become present" with one another with the past being in the past, the future in the future, and accept that we're just here talking to each other, nothing new will happen. You're going to walk away thinking what you already thought, and I'll walk away continuing to think what I already thought. There are many approaches to inducing the moment of change – that moment when a real transformation or shift happens. If you look at what's in the moment of change, at the very moment when the altered state occurs, there's nothing there. The past is in the past, the future is in the future, and it's rather like a funnel with a vacuum in it. So the question is how to talk to each other, and what questions to ask that will induce a state where we will want something new to happen? VB: And we don't always have to have dialogue although it helps. We can just "be present?" Charles Smith:	It has a lot to do with how the person is being. A friend of mine, Alexander Berlonghi who has a successful coaching practice in Italy and South America, does ontological coaching. This means he coaches "being." He coaches about the way you're being on the phone, and the way I'm being on the phone. The way you are in life and at work. Some time ago I was at his lovely home in the mountains of Northern New Mexico where he said a very interesting thing. He said people are seeking the same experience as when they were in the womb. In this state there is no "I;" it's "we." People want the feeling of being connected, of "we." There's silence, there's warmth, and there's support. There's a "freedom to be," and a "freedom to act." If you carry this metaphor far enough it becomes another useful way of getting to a state of "presence." You get to it from silence. You can get to it from an inquiry. You can get to it from dialogue. You can get to it by pulling the rug out from under what people already think, by posing questions they don't have the answer to, and engaging in inquiry. There are hundreds of ways to get to this state. VB: Is "paradigm paralysis" the major impediment to sustainable transformation in many of the organizations you have worked with? Charles Smith:	Yes, I believe that paradigm paralysis is generated from excessive attachment to your identity. The less certain you are about who you are the more new things will happen for you. There will be novelty and therefore transformation. The main obstacle to sustainable transformation is also identity – the identity of the Palestinians, of the Israelis, of General Motors which kept it from changing despite declining market share, and the identity of a husband I know whose religious beliefs prevent divorce despite the extreme unhappiness of the couple. For human beings everything flows from who they think they are and a desire to retain this identity. If you're an author you'll think it's important to keep being a writer or author. If you're a maker of cars, it is what's most important to you. I've been thinking about the "Extinction Factor," and what may be leading humanity to its doom. The answer, as far as I'm concerned, is our attachment or addiction to our identity, to who we think we are. The answer to why people and companies get stuck in place is found in what people are addicted to. This is what maintains the paralysis. It gets supported by bureaucracy, a lack of communication, and by a whole list of other things which I describe in Navigating From The Future. For a few years I worked for one of the top five consumer goods companies in the world and the executive in charge of this firm was addicted to process. Parenthetically, I would say this is also true of our government in the U.S. in so many ways. In the consumer goods company if the solution was not in the nature of a process, this executive wouldn't abide it. His identity – who he was, how he had succeeded, and how he had come to this place in life – was based on an adherence to process. A lot of problems, challenges, and opportunities have to do with internal or external relationships, but he couldn't consider them. Every one of them was turned into a question of process. VB: Can you consciously change your identity or is it something that is inevitable? Charles Smith: You can loosen its grip on you, meaning you can make it subside. You can put it away for a while and, over time, you can expand the amount of time it doesn't control you. There are some aspects of your identity you're stuck with; you acquired them when you were very young. Speaking personally by way of an example, in many ways I'm not who I was a few years ago as a result of practicing the ability to see the world in a more expansive way. I used to be sure I was an American, and I'm not sure of that any more. I've spent so much time in other countries and seen so much good and bad in those places that my American identity has been loosened. VB: It's probably a good thing. Charles Smith:	It's a wonderful thing; it is freedom! Many people are absolutely certain of their beliefs about themselves and other people. I know someone who has lived in a small town his whole life, and he is certain that people in a small town are better than people in big towns. Taking it to the extreme, if you gave guns to him and others of similar identity and this identity went on long enough, there could be a war between big and small town people. Charles Smith: It becomes dogmatic, that's right. Dogmatic, rather than the freedom that results from a moment-to-moment creation and invention. Freedom is the ability to choose how to be. Life's like that. VB: "Organizations with the most available energy will prevail." Should this knowledge encourage people within large and complex organizations to eliminate silos in favor of cooperation and coordination of activities? Or is it even possible to do so? Charles Smith:	Those are two different questions. People's behavior regarding silos and of almost everything else is related to what they see. In order to minimize silos in a sustainable way, provided you're not just simply trying to get people to behave differently, you want to change what they see. If you once were bitten by a dog and now see a dog while walking down the street, you will see it as a threat. Or consider the example of a great tennis player. A ball comes at him at 100 miles an hour but he doesn't see it the way I would. For me it would be a blur. Professional tennis players actually see the ball. I give an example in the book of what happened to me. I started to believe that the organizations with the most available energy and focus will win, and that energy flows where the attention goes. The more I believed this, the more I started to see the world this way and the more I saw my job as encouraging, enhancing, and enabling vitality or energy in any given situation. Red Auerbach, the legendary head of the coach of the Boston Celtics basketball team, once said in a video that his entire job was to ensure there was team spirit. He said the players are talented; they know how to do their job. They know how to play their positions. His job was to elevate the team's spirit when it went down – to bolster the players' energy and vitality and thus of the team. In an organization everything from the bureaucracy to leaders' forceful command and control behaviors thwart the flow of the energy. If leaders consider their job, among other things, to be stewards and enablers of energy and vitality in their organization, then they will start to see the world this way. The result will be people in the organization becoming much more cooperative because this results in a flow of energy among the employees, and between the employees and their work. VB: When you said it becomes more cooperative, I presume you mean that relationships become more cooperative within the organization. Charles Smith:	Relationships in the organization generally become more cooperative. VB: Energy and a positive outlook, a positive attitude, are very much related? Charles Smith:	Yes, energy comes from people's way of being. The energy and vitality are already there. All you need to do is not suppress it. A positive attitude enables you to be a conduit for directing the energy in a way that helps you, other people, and the company as a whole. VB: You posit that "navigation" is a higher level of thinking. Can we learn this level of thinking and, if so, how do we go about it? Charles Smith:	In 1987 a colleague of mine, Frank White, wrote a book called The Overview Effect. The "Overview Effect" is something that happened to a number of astronauts when they looked from space at the Earth, its moon, and the universe. There was a transformation of consciousness at a level that we'd all like to see within a company, within a country, or in the world. They saw no boundaries. They saw the possibility of people really getting along if only they could see their world from that expansive point of view. We are developing an organizational training program, called "The Overview Experience," for personal and group transformational training. It will include state of the art videos taken through the Hubble telescope that will give people the experience of being in space. The intent is to recreate this Overview Effect at the same time as they are having a transformational dialogue about their most important strategic concerns and questions. What's interesting about your question whether we can learn this level of thinking is that only certain astronauts felt this effect. Somehow they were ready. Others were so focused on their engineering job, or their training had been so object, linear, and physical reality based, that the Overview Effect didn't happen for them. I believe that some people can learn this level of thinking, but I suspect they have to be ready for it by virtue their heritage, history, training, family, or culture. VB: Or maybe a lack of training, a lack of specialization. Charles Smith:	Or a lack of dedicated training. I've come to see that in almost everything there is a training problem. I did a course with William Edwards Deming before he died. He said the Japanese don't see problems as problems with people. They see problems as being problems with their training. The job then becomes to find the kind of training that will teach what needs to be taught, and to teach it with supreme conviction. My wife and I home schooled our boys for a number of years. I've been a coach, teacher, and consultant for a long time but it was the first time in my life that I meant to teach as much as I meant it with the boys. I wanted them to learn, and was committed to their learning what we were teaching them. It worked amazingly well. One could ask, what's the reason it worked so well? Are these especially bright kids? Were they open to this approach to learning? I think it had a lot to do with the conviction we brought to the process. So could we train Navigators if we really meant it? I'm sure the answer is yes. If it was a certification course, out of a hundred people how many would get it? I'm sure there would be a lot of people who wouldn't want to, many would get it somewhat, and a lot would but not practice it. In China they say that in order to have knowledge you have to learn something and then practice it. Becoming a Navigator is a practice as much as anything else. VB: Is thinking from the future different than having imagination? Charles Smith: Thinking from the future is a lot like imagination. It is less and less clear to me where it comes from. The late David Bohm said that thought is largely a collective phenomenon. You and I experience it in our heads, but our thoughts are largely a collective phenomenon. It happens in the space between us. As it occurs, it's like imagination in that you're inventing something. A friend of mine, Howard Sherman, saw an unpublished letter Albert Einstein wrote to a friend. The friend had showed Howard the letter. In the letter Einstein said that he found a code breaker in all human endeavors – even science, business, art, medicine. The code breaker, according to Einstein, is that there is no necessary relationship between sense experience and thinking. This means that normally when you experience something – see, feel, touch, or hear it – you think something. What you think is perfectly logical to you, such as right now you're thinking something about what I'm saying. Einstein said he had discovered that what we think and what we experience is arbitrary. It's totally made up, based on what we already know, have been told, or think is real and true. He said once he realized that our thoughts are only there because we have made a causal relationship between a thought and an action or experience, it enabled him to have a free play of imagination. He understood this code breaker fully with the result he could think anything. He said this is how his thought experiments emerged, which enabled him to think of the theory of relativity where space and time are the same and they bend gravity. This enabled him to unleash the power of the free play of imagination. I've done an interesting exercise with groups of people. When asked to imagine what they would think if one moment was not connected to the next, they have come up with all kinds of new ideas. This contrasts with our usual imagination which comes from our world views, assumptions, questions, inquiries, and practices. It turns out that a memory of the future has as much power as a memory of the past. You can prove it to yourself. Imagine what you want for yourself in three years but imagine it in the present tense. We did this with a large company in Holland two years ago. Its 50 senior leaders talked about the future in the present tense; specifically, in the context of a billion customers, providing health care to all their customers, and a number of other specific matters. At the end of the conversation this future was palpably real. It was not like imagining the future and having a conversation about what the future is going to be like. The future was their experience in the present. In doing this it wasn't just imagination; it was acting as if the future was real. After a while it wasn't acting anymore. VB: It was a true experience. Charles Smith:	It was a true experience with the result it had a riveting grip on their ability to invent and pursue both their business goals and ethical purposes with equal conviction. VB: No doubt it would enable directing more energy at this memory of the future. Charles Smith:	Exactly, that's the purpose. The purpose is always to place attention where you want the energy to flow. It's the design principle for this way of working. VB: "Not thinking about what you are paid to not think about kills one's ability to imagine." These messages about what to not think about in an organization can be openly communicated through written policies and procedures, but are the more subtle methods more insidious and problematic for organizations? Charles Smith:	Oh sure. There's probably more ways for this to happen than we could count. It has to do with the topics raised, the topics suppressed, and the topics ignored. It has to do with how people look at you when you say certain things, what topics are avoided, who has been promoted, and who has the most power in a situation. Ultimately in a lot of large corporations it has to do with what happens to people's bodies. People's emotional expression may be suppressed, they may physically not move around very much, and they may be discouraged from looking at each other with understanding. There's a lot of impact related to the style of contact, range of emotional expressions, degree to which differences among employees are allowed, and whether conflicts are expressed in public. Another important factor is the degree to which employees are allowed, and indeed encouraged, to think "outside the box." Are they encouraged to provide their ideas about potential new business opportunities for the company? Things that are outside the identity box are often the ones that get most suppressed. VB: "I believe that meaningful dialogue comes from grappling with paradoxes and finding some degree of shared meaning with others…" Does this have practical meaning for leaders of businesses and other organizations? Charles Smith:	Yes, it's one of the most practical things a leader can pay attention to. An associate and I gave a talk in Delhi, India a few weeks ago. We spoke a lot about problem versus paradox. David Bohm said that a problem is not a paradox. An example of a problem is I'm thirsty so I drink water in order to not be thirsty anymore. A paradox is a set of conflicting, contrary forces. I want something but I can't have it. The company doesn't have the resources or the leaders don't want to do something that would be good for the company's long-term financial viability. If you treat a paradox as if it's a problem it gets worse. If you try to fix a paradox it gets worse. If my wife intensely wants something and I am equally forceful that I want something different, things will likely get worse if I try to fix this situation. With a paradox whichever way you push, something will push back at you. It's a whole dog's breakfast – a set of contrary forces. Most of what senior leaders deal with is paradoxes, such as organizational hierarchies, pressures in the marketplace, or uncertainties with the financial market. These are paradoxically constructed problems and, when leaders try to fix them with a new structure or process, the situations usually don't get better. In these situations you're after shared meanings, a platform for sensible and coherent individual or collective understanding. You want shared meaning amongst the people involved, and this comes from dialogue. Dialogue is not debate. It's not argument, nor is it command and control. Dialogue is open-ended, discursive, and could perhaps be summarized as ‘not going anywhere, let's just talk about it' conversation. With the right groups it often takes the tension out of the situation, and helpful ideas emerge. Sometimes the paradox may go away or the group may face a new one. It's useful as a way of seeing what's going on in the organization so if something is a paradox people won't try to force solutions. I'm coaching the CEO of a large oil company. He's very successful, incredibly bright, and often controls the conversation. After a year or so of our working together he started to see that the biggest thing missing in the company was alignment, and that he was a big cause of the misalignment. Employees were not in the same boat because he was so much in control. He took a whole year to increase the amount of dialogue and engagement with employees in order to produce alignment in different parts of the company. He made it part of his job. The company made more money that year than they ever made before, and he attributes this success to shifting his attention and energies into collective conversations. Out of these conversations people invented their own solutions and action plans, and then moved forward. Vern's note: We will continue our interview with Charles E. Smith in next week's IdeaConnection newsletter. The author will talk about the Navigator Code and which of the 21 items in the code he finds to be particularly instructive. He will also explain "noble purpose," imagining from the future, why there is an inverse relationship between new possibility and the insistence on certainty, the Merlin Navigator assessment tool, his new course called Overview Experience, and much more. 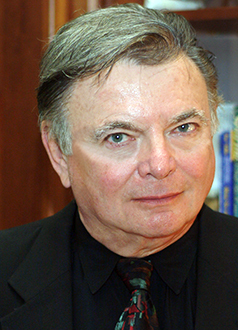 Since 1969 he has been an executive coach and organizational development consultant to senior leaders of companies, associations, and government agencies in the U.S., Canada, and Europe. His focus is on stimulating possibility thinking and helping leaders and groups do what they are capable of, and not just what they do.